Buying a bicycle can sometimes become very personal, the bike itself taking on a different meaning for each rider. Last year both Bob Christiansen and myself, took delivery of two completely different Llewellyn Custom Bicycles, these bikes produced in Darrell McCulloch’s suburban Brisbane bespoke bicycle building workshop. Bob’s custom Cadenzia is a Dura Ace Di2 equipped Llewellyn bike, the first that Darrell has ever built for Di2. The “It Goes” Llewellyn that I chose is based on Darrell’s Crescendo model, the bike is equipped with a Falz carbon fork by Dario Pegoretti and a Campagnolo 11 speed Chorus groupset. 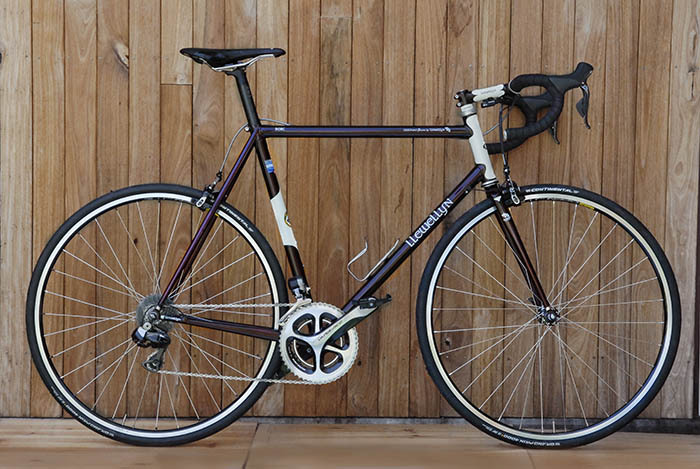 Two diverse and personal bicycle stories about choosing a new Llewellyn bike. First the Crescendo with it’s Pegoretti Falz fork, as this bike became the catalyst that set the chain of events into motion. The Cadenzia, Crescendo "It Goes" lined up next to John Caskey's Llewellyn. By late March 2014 my father only had a few weeks left to live, in the 1970’s he’d take me to races, driving hundreds of kilometres, week in week out .. he’d sit quietly to watch the bike racing, track or road, then drive home again with barely a word spoken, he never said much. There was one day last March that stood out, it was raining and cold in his hometown of Uralla, all he wanted was to sit by the fire with only the company of his dogs. I lit the fire for him and as if I was still a small boy he gave me pointers on how a good fire should be lit, once the fire was burning to his satisfaction, he then just wanted to be left alone. For the rest of the day I rode the gravel roads of New England, threading my way through granite covered hills and eucalypt lined backroads. It seemed right to ride all day, turning the pedals along the unpaved roads, a powerful panacea. In moments like these you know why you ride bicycles when they give us so much. The last few years I’ve spent a lot of time speaking with Darrell McCulloch about bikes, Darrell had built a display bike for trade shows and we’d often discussed the idea that I should take it for a test ride, it was exactly my size. Darrell’s Crescendo which he’d named - “It Goes” was fitted with the Dario Pegoretti carbon fork, nearly all custom orders incorporate one of Darrell’s steel forks, yet the It Goes was intended as a modern steel bike that could be ridden fast. Riding steel again for the first time in many years was a thrill. After my dad passed away I bought the It Goes Crescendo as a reminder of his quiet and unwavering encouragement for my life on two wheels. 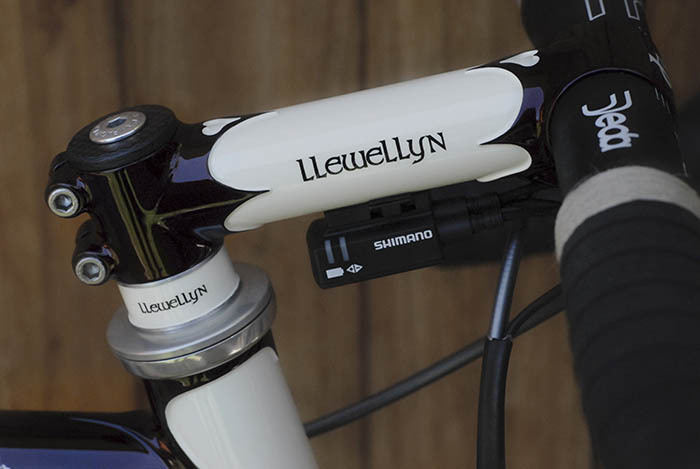 A couple of other factors came into play when choosing the It Goes Llewellyn bike. I’d been riding carbon for years, everyone had ditched steel during The Dark Period which began in the nineties and for some, steel may still seem to be a relic of the past, but steel is making a long overdue comeback. The Bike Nerd who coined the term, The dark Period - where carbon was in it’s initial development phase and steel was seen as outmoded - also suggested that if steel was discovered in 2015, as a previously unknown material for frame building, that it would now be hailed as a wonder material. The ride feel and attributes of steel have provided rock solid reliability and performance since the earliest days of cycling. It was time for me to revisit steel plus I’d never ridden a Llewellyn. I’ve known Darrell for more than thirty years and given the reputation he’s built up over that period, I’d been wanting to ride one of his bikes for many years. If you’re not the type of cyclist who gets paid to race bikes, then there’s something to be said for reliability and the practicality that steel can offer. To boot it’s not everyone’s cup of tea to desire a press fit bottom bracket, squeezed into the lightest carbon frame dependant on friction alone to hold the bearing units in place. With a steel bike good old fashioned steel threads are a reliable option. Then there’s the string of warranty replacements on the high end carbon bikes I’d ridden, a new one about every eighteen months .. paint system degradation, galvanic corrosion, and cracked carbon contributing to the list of failures. The Llewellyn It Goes Crescendo bike with Falz fork by Darrell McCulloch. XL Spirit for Lugs Columbus, Campagnolo 11 speed Chorus mechanical, Campagnolo Record hubs, tied and soldered rear wheel, rims Mavic Open Pro with Deda Zero 100 bars and Deda stem. Prologo saddle with one of Carbon Fizik Cyrano post. I decided that I wanted a bike that was reliable and if I found myself occasionally riding along a gravel road, through a creek crossing, over a cattle grid or on rough pavements, that the bike would hold up for years to come. So the Llewellyn It Goes - Crescendo appeared in my bike lineup. Darrell’s conviction for building reliability into steel frames is the clincher here, he just doesn’t cut corners when it comes to the fine details of building frames which will not fail. Riding with Bob Christiansen we’d been over and over the details of press fit vs threaded brackets and carbon vs steel.Watching the Australian Formula 1 Grand Prix on the weekend, Mark Webber explained the concept of “lifeing” in F1, where parts are scheduled for rigorous replacement at the correct intervals before failure of parts can occur. It’s much the same concept in professional cycling, race it and replace it, in that environment modern components have a limited lifespan and at the absolute maximum, one racing season only. If you’re a consumer, paying for your own bikes, depending on your motives, a slightly heavier carbon frame may be more practical than the latest, lightest bike out there. Bob’s high end, extreme lightweight carbon frame had cracked and been replaced twice in a short period, and was only ridden on very smooth pavements. So when I started turning up for rides on the Llewellyn Crescendo It Goes bike, it wasn’t long before Bob had arranged a meeting with Darrell. Darrell McCulloch puts the finishing touches to Bob's Di2 Shimano Dura Ace equipped Llewellyn. Starting from scratch and building a new bicycle concept, was the challenge presented to Darrell. First Bob delivered a complete Di2 Shimano Dura Ace 2014 groupset to Darrell, the first that had ever entered the doors of Llewellyn. The trick for Darrell was to fully integrate the Di2 setup into a steel frame, hide the cables and battery holder, while keeping the strength and integrity of the columbus tubes intact, in particular the drive side chain stay. 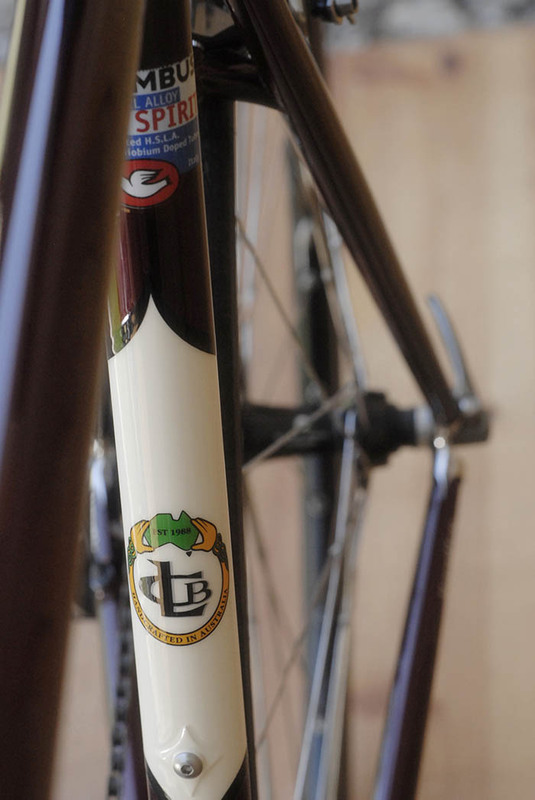 Aesthetics had to be kept to the expected Llewellyn Custom Bicycles standard. 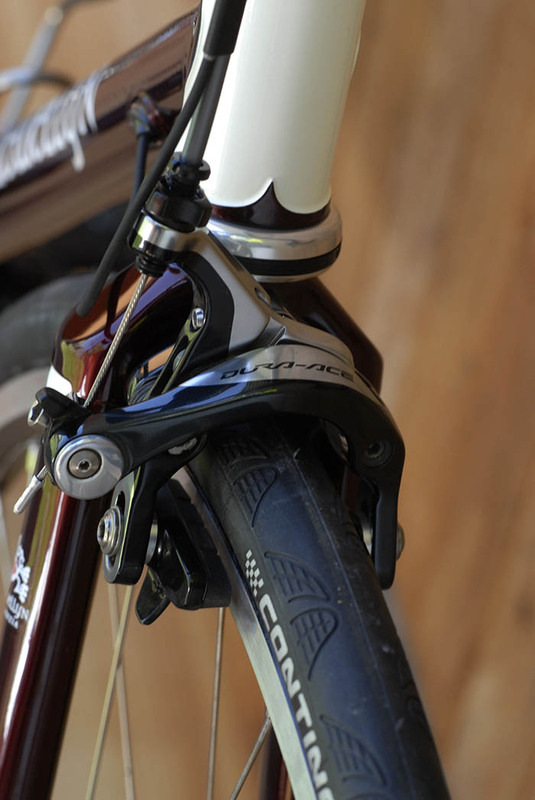 Bob also wanted the modern groupset to match a traditional deep lustrous red and cream paint scheme. 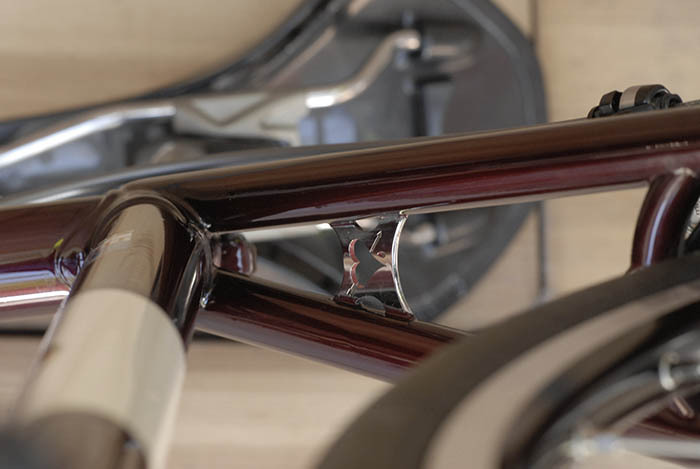 The blending of old and new, creating a functional steel bike with a classic look. The problem for Bob was the day he went to pick up his new bike, he wasn’t certain that the whole project would gel together. Bob also wanted this steel bike to ride day in day out, he knew how good steel could be having previously commissioned Geoff Scott, builder of Gefsco and Clamont bikes to build him a Clamont back in 1992. The Clamont now restored and ridden on special occasions. Bob’s new Llewellyn had to not only perform well, the bike was also required to fit the traditional bill alongside the Clamont, yet display the very best of modern technology with the Di2 Shimano Dura Ace integration. The collaboration between Darrell and Bob was a success, from the moment Bob first clipped into the pedals he knew his Cadenzia Di2 was the right choice. The red brandywine and white pearl paint by Joe Cosgrove gives the 2014 Llewellyn a classic old school look. Darrell spent many hours working on styling and practical integration of the Di2 derailleur cables. This approach to detail is rewarded in a build with clean lines and no unnecessary cables to divert the eye from the traditional concept of the bike. On the drive side chain stay Darrell created the smallest entry hole possible for the rear derailleur cable to maintain strength in the stay. Darrell then created 3D CAD drawings for the chain stay entry by designing a custom boss to fit the 6 mm Shimano grommet correctly, precision is required here for proper reinforcement and ease of threading the cable. Next a solid block of 28.6 mm round stainless steel bar was setup in the lathe and cut in true constructeur fashion. Why work in stainless steel? Darrell’s advice, “so the rust will not start around the edges." 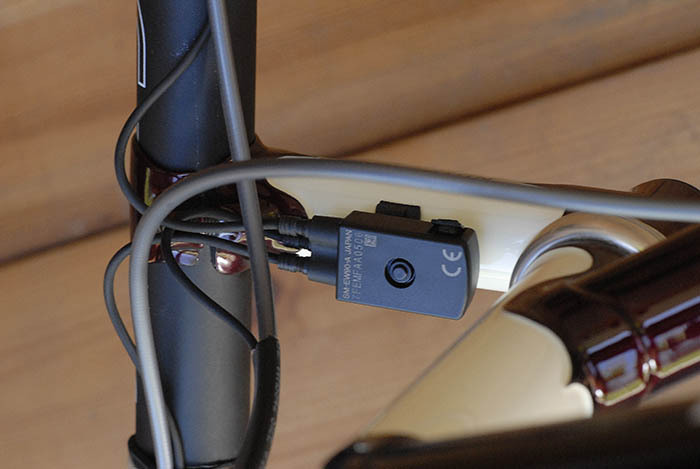 The same level of detail was applied to the front derailleur and it’s control cable. Darrell customised a Richard Sachs, Suntour look alike braze on front derailleur mount. Darrell wrote, “I looked at other builders with cables hooking and looping about the front derailleur and I thought, why? With steel you can make lots of nice details, enter stage left the lathe.” So Darrell made up a few test pieces for a flat surfaced bush to accommodate the Shimano grommet. On the down tube cable entry the process was repeated with design and practicality built in. Darrell McCulloch outside the Llewellyn Custom Bikes workshop with Bob's Cadenzia. Photo by Bob Christiansen. Bob’s Llewellyn was finished with a practical wheel set, with tied and soldered spokes for the rear wheel, and Mavic Open Pro box section rims. Then there’s the way Darrell applies his years of experience as a team mechanic for Australian teams competing in Europe. Darrell finishes every aspect of the build as if the bike was a John Cooper works mini. Whether you choose Campagnolo or Shimano, it doesn’t matter what’s stamped on the logo .. the components just work seamlessly as they should. An example is brake actuation .. Dazza has this down to a fine art where application of the brakes becomes almost telepathic. This bike story is founded on changing technology, especially with the integration of old with new in the Cadenzia Di2 build. Darrell's fastidious undertaking to instill each and every one of his bikes with reliable performance, should see these Llewellyn's being ridden well into the future. Custom “Cadenzia” steel frame built by Darrell McCulloch of Llewellyn Custom Bicycles with custom internal cable routing for Di2. Group Set – Shimano Dura Ace Di2 2014 Tubing - Niobium Steel Alloy Spirit for Lugs by Columbus Lugs - Cadenzia Investment Cast by Darrell McCulloch Forks - Columbus Signature Llewellyn clover leaf cutout to bottom bracket. Cranks – Shimano Dura Ace Chain - Dura Ace Seat Post – Llewellyn Fizik Cyrano 30.6 mm Saddle -Fizik Antares Versus Pedals - Keywin Bottom Bracket - Dura Ace Di2 English Thread Bidon Cages - King Stainless Steel Battery Holder - Ritchey Di2, installed inside seatpost Paint - by Joe Cosgrove Red Brandywine and White Pearl Hand polished stainless steel on : Llewellyn head badge. 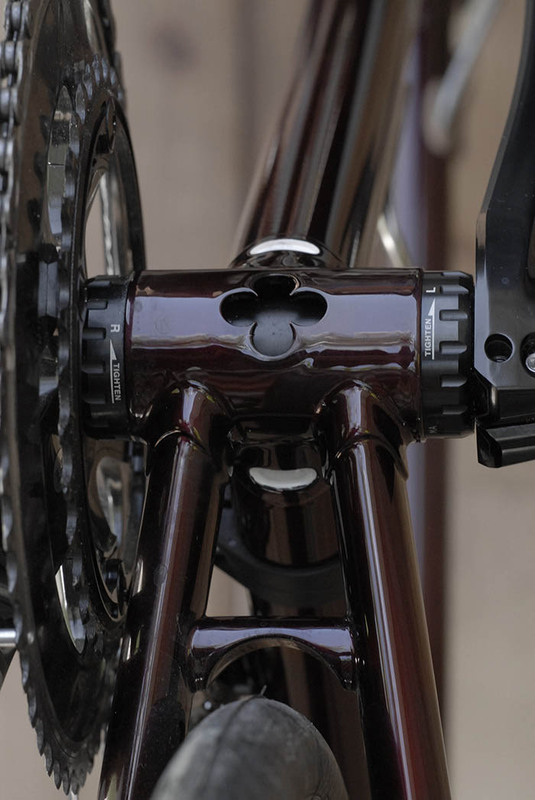 Front and rear dropouts. Top tube rear brake cable braze ons for internal cable routing. 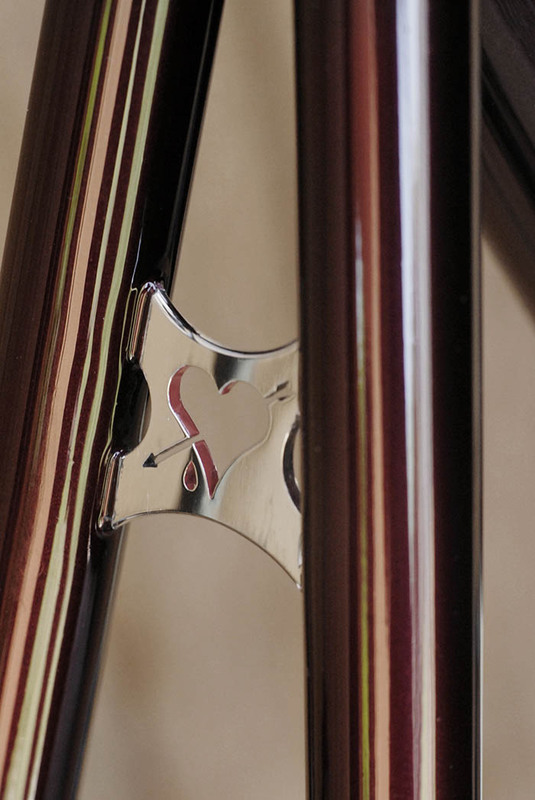 Rear triangle signature Llewellyn heart shaped seat stay bridge. Darrell McCulloch sweated out the details to get the Dura Ace Di2 rear derailleur cable routed perfectly through the chain stay. Achieving minimal stress to the stay with the smallest entry hole possible. For the rear derailleur cable entry to the chain stay, darrell used a lathe, Darrell said "I started with 3D CAD drawings, then a lump 28.6mm round stainless bar and started the cutting." Shimano Dura Ace 2014 crankset. Shimano 2014 Dura Ace side pull brake calliper. Some serious stopping power here, with perfectly tuned actuation. Bob chose a custom Llewellyn lugged stem for his bike. Dazza worked on the fine detail for the Di2 control unit. Fitting the unit nicely by bolting it under the stem rather than attaching the unit by the usual very expensive (but cheap looking) rubber band that comes from Shimano. Darrell said "I attacked the Cadenzia lugs, to make them look different. Each frame I make is a bit different than the last one. 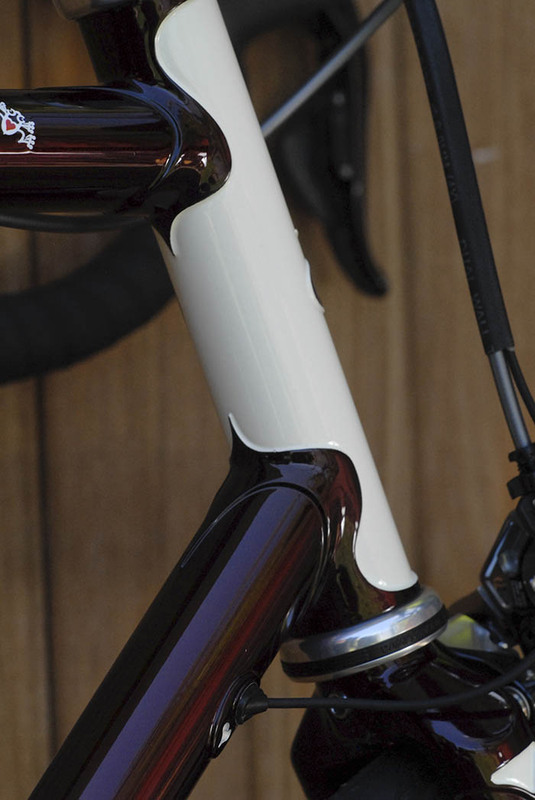 I like lugs with curves"
Deda Zero 100 handlebars, always a popular choice. 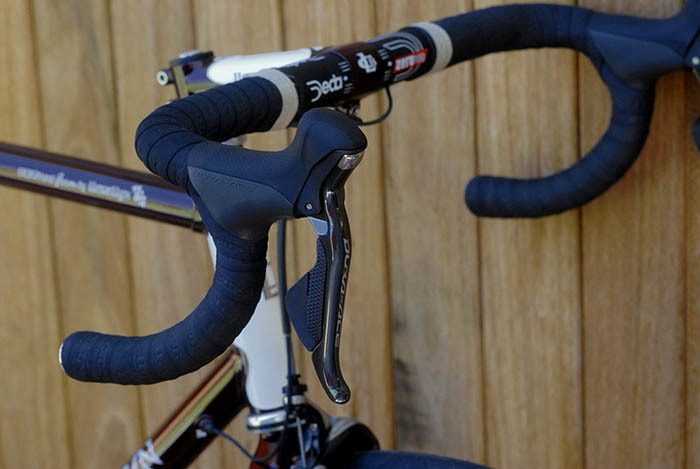 The 2014 Dura Ace Shimano lever performs so well and compliments Bob's retro-nuovo-tech build. Components manufacturers haven't sought to work on slick styling in the 21st century, defaulting to function first. Compared to 1980's Dura Ace and Corsa Record components which set the bar high, today we have printed graphics that would look at home on the side of a packing pallet. Bob went to great lengths to select the appropriate traditionally inspired paint scheme. Joe Cosgrove painted the Llewellyn in Red Brandywine and White Pearl. Darrell went to great lengths, fashioning stainless steel in true constructeur style. 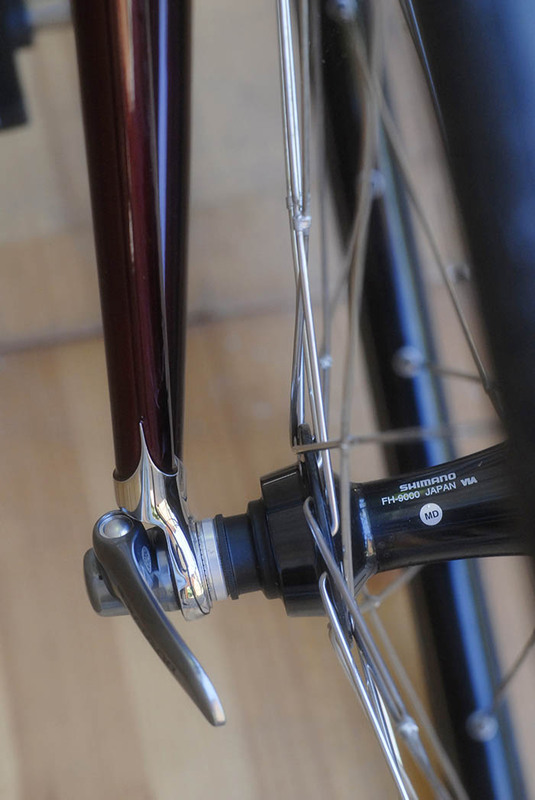 Stainless steel hand polished dropouts on Bob's Llewellyn Bikes Cadenzia. Polished stainless steel Llewellyn bikes head badge. Darrell's arrow and bleeding heart design polished stainless steel. Four holes in a bottom bracket. Tied and soldered spokes for extra durability. It's all in the details, Darrell sweated out the design of every cable insert. The underside of Dazza's bleeding heart design. 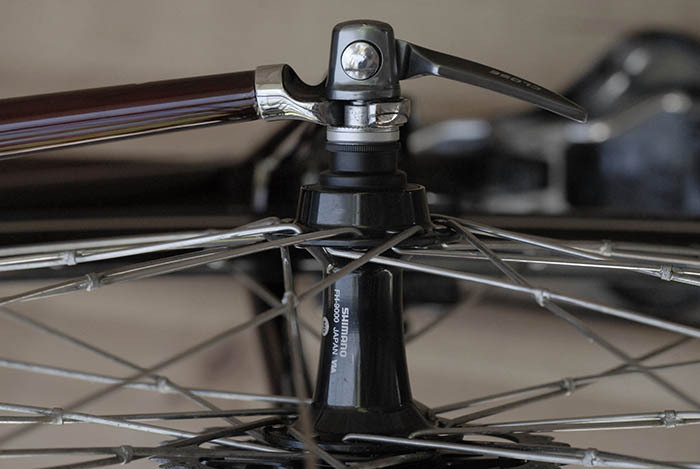 Finally a rear brake for a bicycle that's less powerful than the front. These Shimano brakes are superb. Older PostErnie Old Cycling "By Bread Alone"